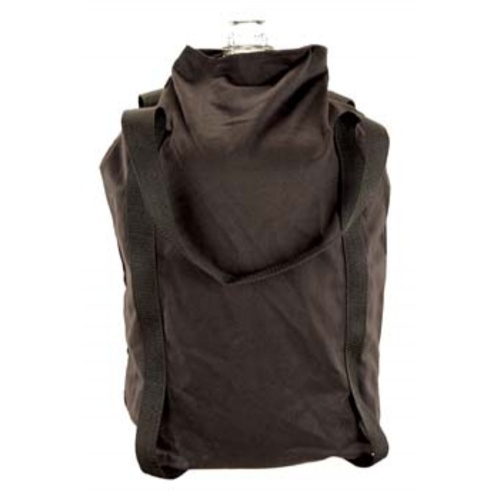 Use this specially made carboy bag to protect yourself and your beer! Carboys can be slippery, especially when wet. Our strong canvas bag allows you to more safely carry a carboy. If it is accidentally dropped the canvas will help contain the broken glass and reduce personal injury. Your beer also benefits as it is protected from light. UV Light interacts with compounds in hops to create skunky off flavor (editor note... I may not be a smart man but I do know skunky flavors in beer aren't good). These are made in the USA from heavy black canvas with strong nylon webbing that is stitched (very strong) to support the carboy when lifting. In the summer, you can help reduce high fermentation temps by placing frozen ice packs in between the canvas and the carboy. Good for lifting. can be used to insulate carboy. I love this carrier. When I was fermenting in my house (I have a fermentation fridge now), I first tried to cover my carboy with a blanket to protect it from light. This carrier makes it easy to handle and keeps the light out. One tip, be sure to put it on before you fill your carboy with wort, it is a lot easier this way. So far I've only used this on empty glass carboys, but already notice a problem getting both corners to fold over onto the velcro. I'm using the smooth neck 6.5 gallon carboys (FE330), maybe the acid carboy style fits better? Regardless, it does make the carboy easier to carry, and I look forward to using it Saturday with a carboy full of fresh wort. I'm pretty well convinced that even with only one velcro attachment, it would mitigate risk of injury from a broken carboy, which was my primary reason for purchasing it. I've just switched from Better Bottles to glass (I trust scrubbing over soaking), and have to walk my wort about 80' and down an uneven set of concrete steps to my fermentation chamber in the basement, so safety and convenience are a big deal. $35 is cheap insurance.